By all rights I should prefer Tokul West. It’s a XC hardtail rider’s heaven, replete with several steep, anaerobic climbs up to fire road plateaus—your springboard for diving into smooth, sinuous singletrack. But when it comes to Tokul, I play for the other team. For me, it’s downhill riding at Tokul East, all the way. But ride them both and make up your own mind. The Ride: Tokul West is a trail explorer’s dream. If you don’t fear getting lost, you’ll discover by chance or perseverance the sundry trail options snaking through the Hancock Timber tree farm property. The trails spurring off the service roads seem unassuming enough, but they lead to fun surprises: creek crossings, switchbacks set along a steep hillside and other natural contours you’ll enjoy riding at breakneck speed. 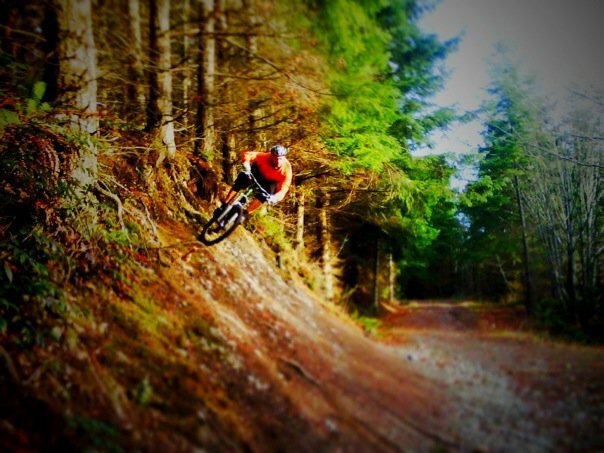 Tokul East, on the other hand, is a DH or all-mountain rider’s winter season playground, with trails that drain well and remain ultra-tacky during rainy spells. It’s also where XC riders may get the itch to trade in their Formula-1 racing machines for something more monster-truck-like. 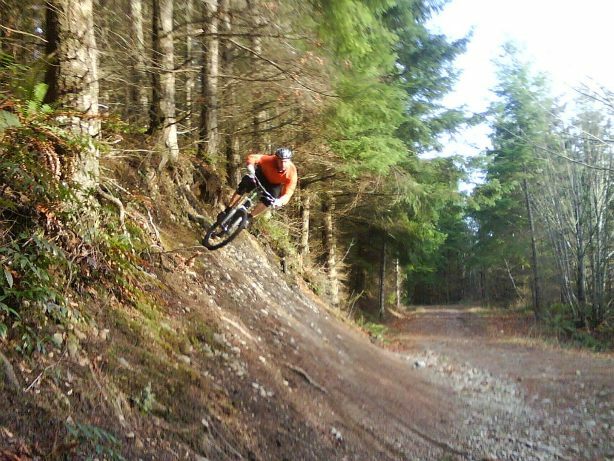 The fast descents, drops, jumps, berms and wall rides are just asking for 5+ inches of travel, and they’re well worth the minor toil of pedaling a heavier bike up the modest fire-road climbs. 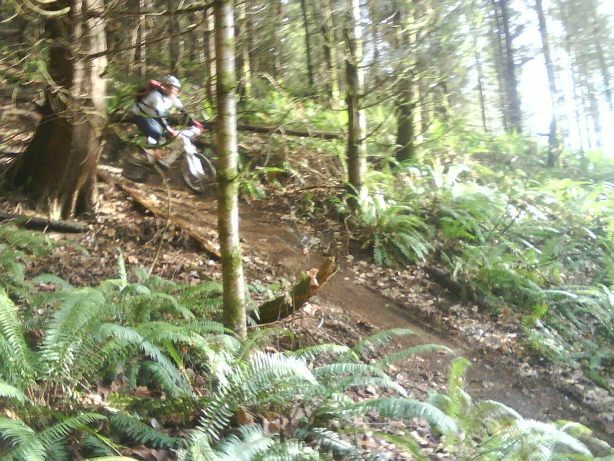 Trail Highlights: Flowtron—You’re not on a bike; you’re on a gigantic swingset. 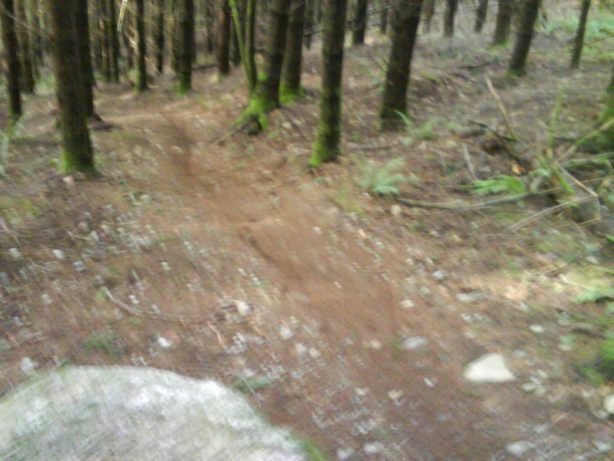 It’s G-out after G-out on this smooth, swoopy trail. Frontier Trail—Chock full of table-tops, drops and berms for honing your skills and chasing down your friends. Optional launching points begin with the trailhead rock and end with the lefthand big drop/run-out section. Crazy Ivan—A grunt of a fire road climb leads to a rolling traverse, the traverse leads to a pump track and the pump track leads to the crazy-vertical part of Crazy Ivan. The steep descent will help you carry speed as you hug the hillside, cut sharp switchbacks and hurdle (optional) tree stumps. Homeward Bound—When you’re ready to head for home, this trail will get you there on time. It starts off relaxed but gets steep, fast. By the end, you’re hauling like a freight train and feeling just as invincible. 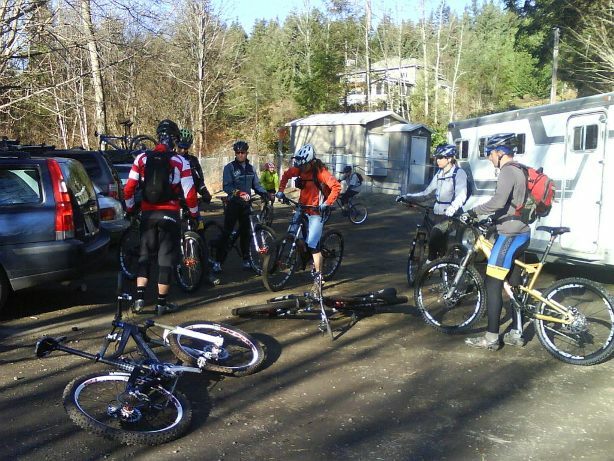 Gathering at the trailhead parking lot on 356th Dr SE. Go left for Tokul West and right for Tokul East. Turn-By-Turn Directions for Tokul East: Ride east from the Snoqualmie Valley Trail (SVT) trailhead parking lot on 356th Dr SE (see driving directions below). 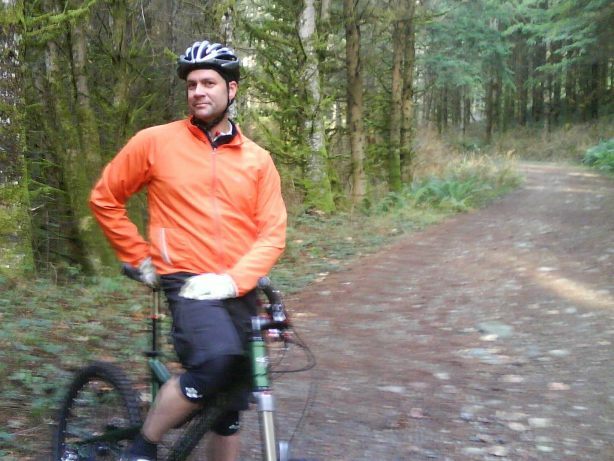 Spin along the railroad grade trail for a half-mile. Keep looking left along the hillside. When you see two steep, side-by-side singletrack egresses, you’re almost to your access point. Look about ten yards beyond these two trails to find a third trail—that’s the easiest singletrack climb up to the service road. Once you reach the service road (attended by identifying power lines) turn left to continue riding uphill. If you want to ride Crazy Ivan, stay on this road until it T’s at the top of the ridge. If you’re looking to do laps on the lower downhill runs, take one of several singletrack trails heading off to the right (east) just before the power line road bends to the left. Ride east on the singletrack until you hit a parallel service road. Take it left for a long, low-pitch uphill grind until it T’s with the uppermost service road. Turn right (east) to access Flowtron, Frontier and other trails. Directions to Flowtron: Pedal east for a few minutes along the uppermost service road until you see a wide dirt trail descending to the right. The road narrows to singletrack after you cross a small log jump. Then hold on tight—you’re not on a bike; you’re on a gigantic swingset, swooping down G-out after G-out. When you hit the one giggle-inducing small drop near the end of Flowtron’s virtual half-pipe, you’ll feel six years old again. Directions to Frontier Trail: Head east on the upper service road and you’ll notice a big rock that some riders have caught air on and others have caught chain rings on. Hang a left on the trail immediately after the rock. Frontier Trail is full of table-tops, drops and berms for honing your skills and fast descents for chasing down your friends. Midway in the trail there’s one optional big drop with a long run-out (stay left if you want to hit it), after which point the trail merges with Flowtron. Directions to Crazy Ivan: Crazy Ivan is best to ride in the winter, when scattered showers prevent it from getting too dry, loose and rutted out. To access Crazy Ivan, follow the power line service road all the way up to a T. This is a grunt of a climb, especially on a bigger bike. At the T, ignore the fire road descending to the left. Turn right and you’re immediately at another T. Take the left and as the dirt road descends, stay to the right. The fire road will pass through a gate and climb gently uphill. As it begins to plateau, you’ll see singletrack heading off to the left. Stay on this trail for a mile or two as it romps over bridges and logs and climbs up to a pump track on the left. Continue on the trail and you’ll immediately encounter the vertical part of Crazy Ivan. Hug the hillside and roll over (optional) tree stumps. When you zoom past an abandoned car (what’s that doing there? 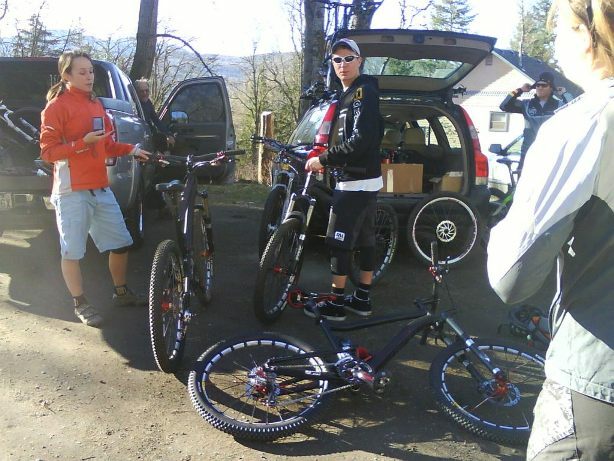 ), there’s still plenty of fun ahead before the trail dumps you onto the SVT. Directions to Homeward Bound: From the bottom of the Flowtron/ Frontier trail exit, begin the road climb back up, but before you hit the first switchback in the road, take the first major singletrack descent on the left. This fun trail will eventually take you across a stream and back to the power line service road. Spin up one short, gravely hill and look for an inconspicuous trail on the left at the first bend in the road. This trail starts off relaxed but becomes Mr. Toad’s Wild Ride all the way back down to the SVT. Fun things to play on at Tokul East. Randall rides the wall. Although Tokul East has dominated this blog post, you’ll find plenty of fun singletrack to ride in Tokul West (secret trails, too). But that detailed trail report will have to wait for another posting. A final note: Whether you ride at Tokul East or Tokul West, be sure to keep a lookout for equestrians, other bikers and the unexpected turn or tree. The only thing to kill that invincible feeling you get when you’re on your bike is finding out that you’re not, in fact, invincible. Driving Directions: From Seattle drive east on I-90 and take the Preston/Fall City exit (Exit 22). At the stop sign turn left and cross over the freeway. Take the next right onto High Point Way, which turns into Preston-Fall City Rd. After four miles you will enter Fall City. Turn right at the stop sign to get onto Hwy 202 (SE Fall City-Snoqualmie Rd). Continue for about a mile and turn left 356th Dr SE. Go up the short hill and park on the either side. This is the trailhead for the Snoqualmie Valley Trail. Tokul East and Tokul West are accessible from this lot. 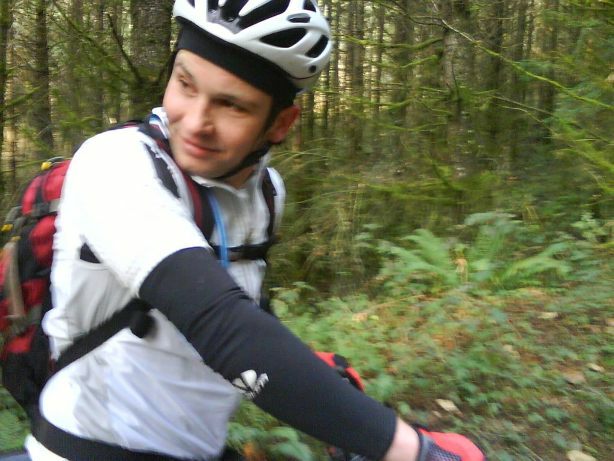 This entry was posted in Biking, Fall City trails, Washington (Western) and tagged Fall City, mountain biking, Tokul Creek, Tokul East, Tokul West, Washington. Bookmark the permalink. 1. “Frontier” is “Last Frontier” whose namesake is the builders’ traditional post-ride destination in Fall City. 2. “Homeward Bound” is “Lower OGDH”. Upper OGDH is made up of the trails that cross the climbing road. 3. The Crazy Ivan descent from the pump track is super-blownout as of this spring, having sustained heavy damage from motos and brake-draggers. If you are uncomfortable on the steeps, please do not schralp this trail. 4. The exit from Crazy Ivan to the SVT is blind, and some moron cut out the log that the builders left intentionally to slow down traffic (and provide some moto/horsey protection). Please, please slow way down when exiting so you don’t t-bone the hikers, bikers and horse riders on the railroad grade.